I've recently come across, at a Turkish online auction site, this Turkish children's weekly magazine from 1952 which apparently serialized the British-made Alice In Wonderland comics adaptation originally serialized in Britain's Mickey Mouse Weekly the year before. The reader-bound volume of the first 40 issues of Karınca [the Ant] was offered at an unreasonably high starting price and I couldn't afford it (it did not receive any bids anyway). Hence, I don't know if it featured any other Disney comics, British-made or otherwise. The cover illustration at the right of the above image looks familiar, but I cannot immediately identify its original source. Karınca was published by Nihat Bali and its editor was Ramazan Gökalp Arkın. According to the (often unreliable) Çizgiroman Ansiklopedisi, Bali (1928-1991) had made traced Mickey Mouse comics for a Turkish children's magazine in 1945. He is better known as a satirical/humourous strip artist, the short-lived Karınca marking his only stint as a publisher. 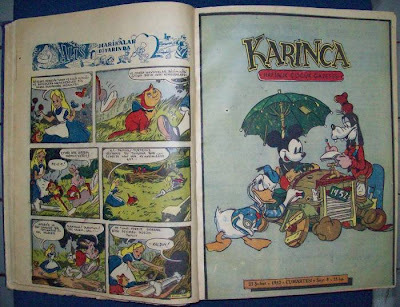 Prior to Karınca, Arkın had also worked as editor in Şen Çocuk, a children's weekly from 1945-46 which had serialized a traced/redrawn version of the comics adaptation of Pinocchio. Later in 1952, Bali would handover the ownership of Karınca to Arkın. 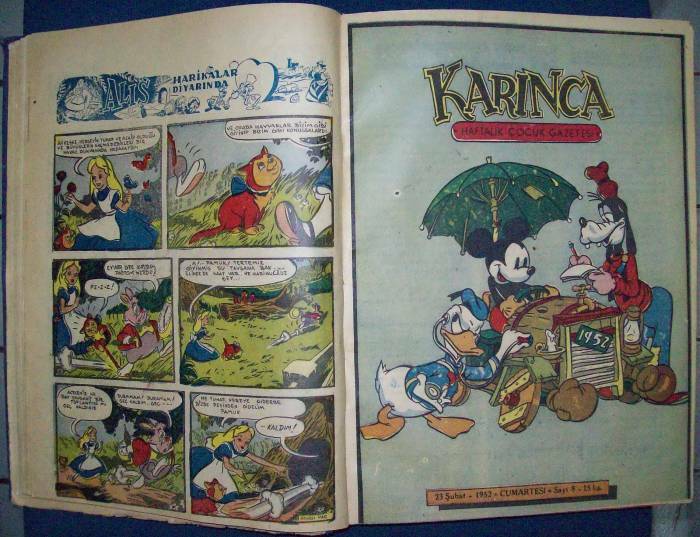 In 1966, Arkın would publish the short-lived Disney comics weekly Renkli Miki as well as a series of illustrated Disney story books. I would very much be interested in this, can you pass on the information of the site/item? The image of Mickey, Donald and Goofy with the car is a reproduction of a 1937 Collier's magazine cover. The opening price is 500 TL, which is approxametly 333 US dlrs.